We chose this article from the Guardian.com because it reveals part of the web of lies we've been told over this period and how deep in European Politics the British were prepared to go to undermine National Socialism in Germany and Fascism in Italy. This again weighs in favour to the Axis Powers who's struggle was their alone, and what they were ultimately up against. 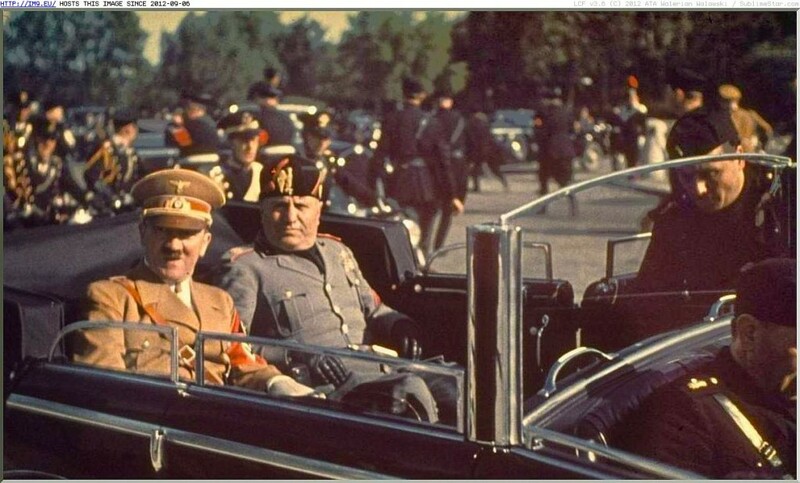 In the spring of 1934, Mussolini was informed of a “Jewish plot” to overthrow the Fascist government. An Italian Jew named Sion Segre Amar had been arrested while smuggling anti-Black Shirt propaganda into Switzerland from Turin. He belonged to Italy's pro-British Justice and Liberty movement made up of disaffected Catholics, Jews, army stragglers and a handful of frustrated adventurers. Members were known as giellisti after the movement's initials “G” and “L” (for Giustizia e Libertà). A total of 17 giellisti were held in Turin for questioning. Among them was the painter and doctor Carlo Levi, later famous as the author of Christ Stopped at Eboli. Only three giellisti were tried and convicted, but the 1934 subversion plot threatened to weaken and divide Italian Jewry at a time when it faced the common threat of Hitler. Dreadfully, a pro-Fascist Italian Jew had betrayed the conspirators: in the Italian resistance where the risk of betrayal was constant, a sense of trust and fellowship was vital. After Hitler occupied northern Italy in November 1943, fortunately, the political movement against Mussolini evolved into an organised mass of factory workers, peasants and intellectuals. Italians now had to take sides for or against Germany. Target: Italy, by the Oxford-based historian Roderick Bailey, chronicles the British government's role in fomenting anti-Fascist activity in occupied Italy between 1940-1943. Agents were trained in counter-subversion and behind-the-lines sabotage by Britain's Special Operations Executive. Recruits were taken from among Italian prisoners of war captured in Egypt and Libya, and from Italian immigrant communities in Britain and the United States. Britain had at first endorsed Mussolini and the cult of ducismo. Throughout the early 1930s the dictator was feted by most of the British press and was on good terms with King George V. Relations deteriorated after Italy invaded Abyssinia in 1935 and Britain imposed unexpectedly harsh sanctions. Mussolini declared war on Britain in June 1940. The SOE made little headway at first, says Bailey. Justice and Liberty had been forced to go underground in 1937 when its founder members, Carlo and Nello Rosselli, were found murdered at a roadside in Normandy. Mussolini's secret police, OVRA, had hunted the brothers down in their French exile and slit their throats. However, Italy's surviving giellisti had regrouped in 1942 as the Action Party, named after the Risorgimento patriot Giuseppe Mazzini's Partito d'Azione. With the help of the SOE, they took up arms against the Nazi intruder and Italian fanatics in German uniform. According to Bailey, only a handful of SOE recruits were thrill-seekers or mercenaries. Fortunato Picchi, a 43-year-old former head waiter at London's Savoy hotel, was motivated by a sense of duty to the allied cause. Issued with British battledress and identity discs, in February 1941 he was parachuted into the Naples area with 34 other SOE operatives. Caught up in the Nazi-Fascist dragnets, Picchi was captured and eventually executed while strapped to a chair with his back turned to the firing squad: the Fascist way of disposing with “traitors”. His mission to blow up an aqueduct outside Naples had failed. In Britain, nevertheless, Picchi was feted as a hero (“SAVOY'S PICCHI DIES FOR US”, hurrahed the Daily Express). The War Office even planned to make a film about him. He was one of an estimated 18,000 Italians resident in Britain at the time. Not a few of them were Jews on the run from the Fascist antisemitic laws of 1938 and wished only for Fascist Italy's demise. Mussolini's cosh gangs conspired to deport more than 6,800 Italian Jews to Auschwitz and other Nazi death camps. Mussolini made no attempt to justify the outrage; Hitler, at least, was lethally committed to his ideology. Giacomino Sarfatti, typically for an anti-Fascist Italian Jew, viewed the Resistance as a “second Risorgimento” which, like the first Risorgimento prior to Italian unification in 1861, sought to rid Italy of a foreign power. Sarfatti was studying agriculture at Reading University when the SOE found him and trained him as a wireless operator. In December 1942 he was dropped into enemy-occupied Lombardy, where he began to transmit and decode messages and establish links with giellisti and other anti-axis partisans. He survived the war to become Professor of Botany at the University of Siena. How much the SOE succeeded in fostering resistance in wartime Italy is debatable. Italian partisans liberated Genoa and other northern cities without recourse to the SOE or other allied help. What is certain is that the SOE provided a symbolic hope and moral support to Italian patriots in their struggle. Roderick Bailey was appointed by David Cameron in 2012 to write this “official”history. Drawing on long-classified documents, he amplifies on David Stafford's earlier account of Italy and the SOE, Mission Accomplished, to produce a readable, fast-paced narrative. Due to Mussolini’s support for Adolf Hitler, Allies (controlled by Jews) tried to destroy the economic systems of both Germany and Italy prior to WW2.